We are located in the 4th district of Vienna, right next to the city center in the vicinity of Karlsplatz. 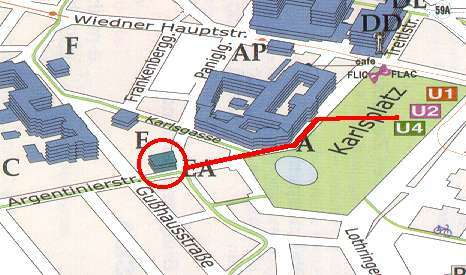 We are located near the famous Karlskirche. If you arrive from the airport, you can use the bus or train service between the airport and the city air terminal to get into town. Shuttle services and taxis are also available. For further information please read our visitors guide. You can use the subway lines U1, U2 or U4 and exit at Karlsplatz station.